From the phrase "Give me your tired, your poor, your huddled masses," the "huddled masses" part rings most profoundly in Golden Door, a ground-level portrait of Italian immigrants and their arduous journey to the New World. As soon as a group of villagers abandon Sicily's wide-open expanses for a ship across the Atlantic, they and their fellow travelers rarely have more than an inch between them: From the boat's pipe-framed bunks to the maze of pens at Ellis Island, they're shuffled along like cattle to the slaughter. Even when America is on the horizon, a cruel fog denies them a glimpse of the Statue Of Liberty, and the opaque windows at Ellis are no relief, either. 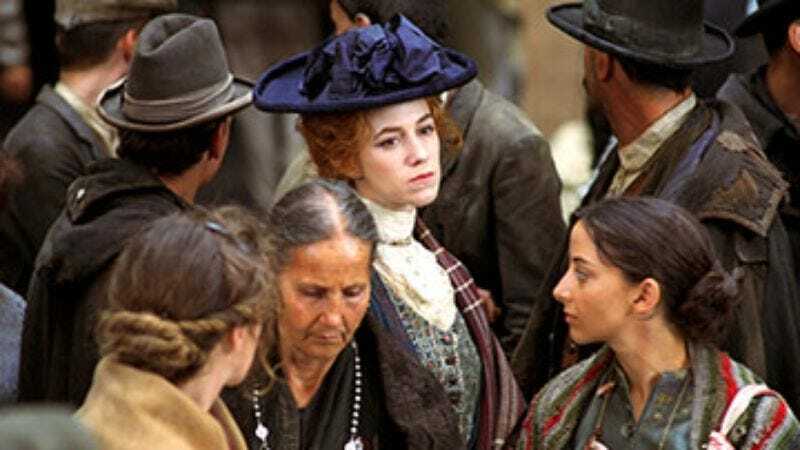 At no point during Emanuele Crialese's scrupulous historical drama does anyone assuage these immigrants' uncertainty about making the voyage; all their superstitious minds can imagine are glorious rivers of milk and a harvest of olives the size of Plymouth Rock. Crialese's focus on the trials and hardships that the huddled masses face helps compensate for his sketchier portrait of them as individuals. Opening in a small, desperately poor Sicilian village, the film follows 38-year-old Vincenzo Amato and his son (Francesco Casisa) as they climb barefoot up a rock mountain to ask God for guidance on whether to stay home or journey to America. Amato gets his answer when his other son, a deaf-mute (Filippo Pucilo), presents him with photos of a wondrous place where the ground is impossibly fertile and money literally grows on trees. Along with his superstitious grandmother (Aurora Quattrocchi) and two other girls from the village, Amato and his sons cram onto a ship and cross the Atlantic with no money and no prospects. Once on board, Amato meets Charlotte Gainsbourg, a bourgeois woman who's been betrayed by a lover and who clings to Amato as her only hope of gaining admittance to the country. The plight of Italian immigrants from the Old World has been so well-handed in other movies, specifically America, America and The Godfather, Part II, that it leaves Golden Door little with which to distinguish itself. Though Crialese pauses for a few beautifully impressionistic images—including a great final shot—too much of the film gets stifled by a dull palette and a safe, middlebrow sensibility. However, once Golden Door reaches Ellis Island, it excels at documenting the humiliating (and sometimes terrifying) physical and mental tests that face these weary travelers, as well as the creepy ritual of marrying the women off to anonymous American suitors so they can gain entry into the country. It's a harsh reminder that the inscription on the Statue Of Liberty doesn't include the fine print.